Where we often go for a delicious dinner at Christmas, mostly I choose a delicious brunch at Easter. With nice sandwiches, a delicious egg dish and something with chocolate (chocolate is always a good reason to think of). Because of my allergy, I can’t just eat all the special breads, so I often make them myself. And when you finally have your bread in front of you, homemade is also extra special. For example, I made this sweet bread in the shape of a wreath with three different types of dough. First I made a basic white bread dough and divided it into three. I mixed the first bowl of dough with currants and ginger powder. A nice orange tint in the final dough as a result. I mixed the second piece of dough with currants, gingerbread spices and walnuts. That way you get a light brown dough. The last dough was kneaded with fig jam and ground cashews. 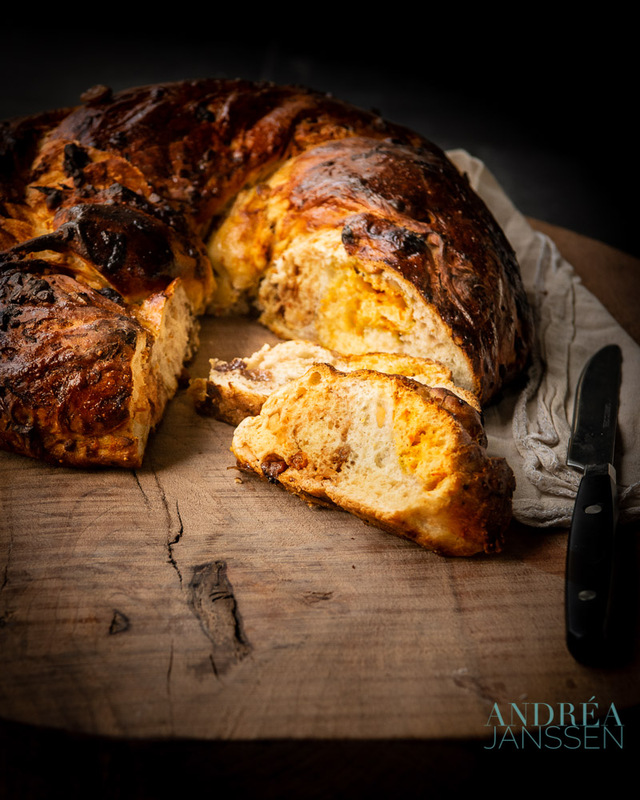 By rolling out all the doughs after sufficient ripening time in long strings, then braiding them and forming them into a wreath, the final dough was created. But I see you thinking now, it will not be Easter until a week later, then that bread is no longer good to eat. You are absolutely right. That’s why I freeze the bread immediately after baking and cooling. The evening before Easter I get it out of the freezer and on Easter brunch it’s ready to be eaten. I often heat it for 10 minutes in the oven, so that the butter melts nicely on this bread (but yes that’s a personal preference, you can also eat it cold). And now it may sound like a very elaborate recipe, it is certainly not more difficult than baking a normal loaf of bread, so don’t let that stop you. In a bowl, knead the bread mix with the water and butter to form a dough in about 10 minutes. Let the dough rest for 30 minutes and then divide into three equal parts. Mix the grated carrot and ginger powder into the first dough and knead well. Grease a bowl and put the dough in it. Cover with plastic wrap and let rise in a warm place for 30 minutes. Knead the gingerbread spices and walnut into the second dough. Spoon the fig jam and cashew nuts on dough 3 and knead well. Take one of the doughs and form a strand of approximately 2 cm thick. Repeat that for all three doughs. 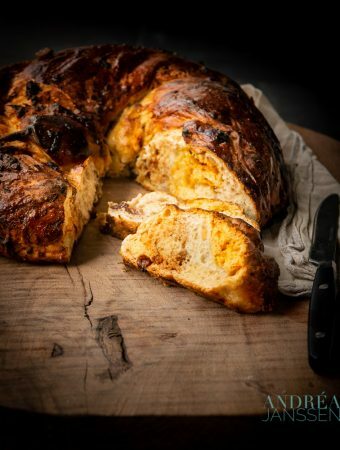 Braid the dough together and form a wreath. Press the end firmly. Lay the dough on the baking tray. Let the dough rest for another 15 minutes. Brush the dough with the beaten egg. Bake the bread in the oven in 25 minutes until it is done. Easter egg hunting. When the children were small it was a party in itself. And every year it was a surprise what the weather was going to do. Because Easter can fall very early but also a month later. So we’ve hidden Easter eggs in the pouring rain. Soaking wet we came into the house. It was so cold that day. And I also can remember once again that we had an Easter egg hunt with friends and their children. It was lovely weather and we sat on the terrace while the children were going to hunt. They were of course not put down too easily, because then they would be back very quickly. So an hour before all the kids were there, it was expertly done by the Easter Bunny. But if you can sit on the terrace in the sun, like on that day, then that also has an effect on the hidden Easter eggs. The kids returned with a basket of chocolate fondue instead of recognizable eggs. And the chocolate was everywhere. On hands, faces and clothes. But what a wonderful day we had. We’ll talk about it now and again. 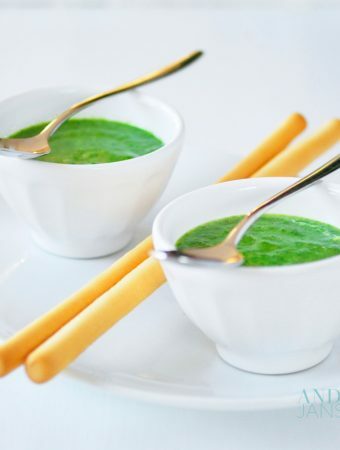 And because you, whether you’re sitting on the terrace or drying up nicely by the stove, you want something tasty with your coffee or tea, this simple but very tasty recipe is the answer. A turban in which you hide chocolate eggs. Because they have been in the oven, they are wonderfully soft and therefore you won’t break your teeth on them. Together with the creamy cake a real treat. In the recipe I used milk chocolate eggs, but you can vary deliciously. Consider caramel sea salt eggs, white chocolate or hazelnut. I am curious what filling you will use? butter and flour to grease the mold. Brush the turban shape with butter and then dust with flour. You do this by scooping a tablespoon of flour into the shape and then turning it around and beating, so that the flour is everywhere. Then you shake the remaining flour out of the form. Mix the butter with the sugar and a pinch of salt, about 5 minutes. Mix in the eggs 1 by 1. Only add the next egg when the first one is incorporated. Mix for 3 more minutes. Sift the flour over the bowl and mix everything lightly. Spoon the batter into the turban shape and smooth the top. Divide the Easter eggs over the batter. Place the turban in the oven and bake for 55 minutes. Remove from the oven and let it cool slightly on a rack for 5 minutes. Then remove the cake from the tin and let it cool further. TIP: For an even more Easter decoration, fill the inside of the cake with chocolate eggs. Shrimps, the ugly gray translucent creatures that, when you heat them, change into a nicely marbled pink and are bursting with flavor. Nowadays I buy them peeled and deveined. Because it is quite a work to do, and on a busy weekday, I want a kind of 30 -minute meal. And it works with this dish (if the pasta is prepared) fine. And because you’re hiding the shrimp in the spaghetti, something that our kids love, they eat it anyway (because they will not choose shrimp voluntarily). This dish combines the spicy shrimp with salty and creamy spaghetti carbonara sauce and the several flavors combine very nice toghether. Really worth a try ! Chop the pepper finely and press the garlic flat. Mix in a bowl the eggs, egg yolks and cheese and stir well. Put a pan of water on the stove and bring to a boil. Pour oil in a frying pan and add the butter. Heat on medium heat until the butter is melted. Then add the pepper and garlic and stir-fry for 1 minute while the butter / oil mixture absorbing the flavor. Also put the spaghetti in the boiling water. Stir-fry the shrimp 3 minutes or until they are pink and turn the heat off. Drain the spaghetti and place in a bowl. Remove the shrimp from the skillet and put them in the spaghetti bowl. Strain the sauce and pour it over the spaghetti. Take the parmesan cheese / egg mixture, add to the spaghetti and mix quickly. 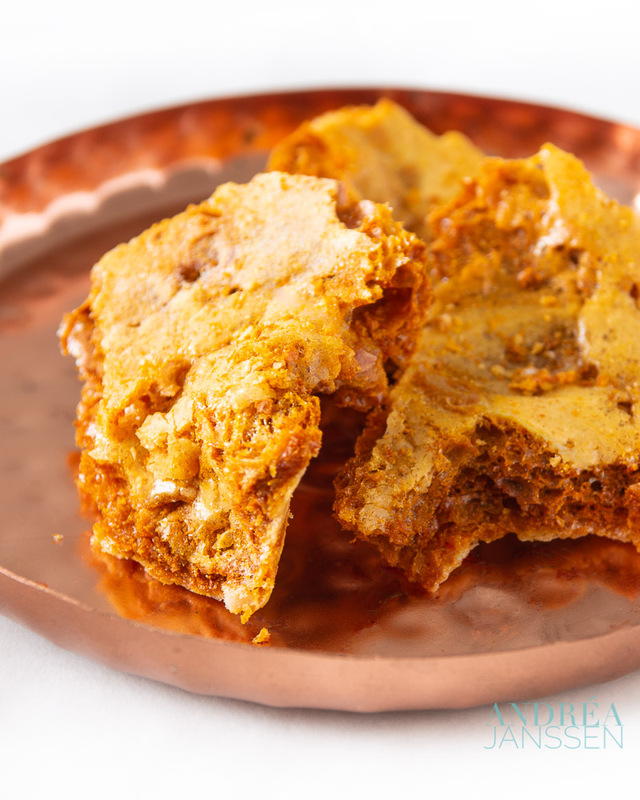 What a spectacular recipe: honeycomb toffee . Not because it is so difficult to make , not at all. A total of 10 minutes and some waiting time and the recipe is done. But it’s so fun to watch what happens when adding the baking soda to the caramel. The dish is bubbling and foaming, and the first time I made ​​it, I was afraid it was not going to end well, but it is a tasty recipe. Nice to take as a gift, but it also delicious as part of a high tea . Did you also enjoyed the weather today? 20 degrees Celsius was the thermometer here (and it’s still wintertime). What a wonderful day . A day that you just have to be outside. I just went around with my camera. What are the flowers early this year! And what a contrast to last year. And after I had returned home with the camera I went to the terrace enjoying a delicious cup of tea. With a piece of toffee, of course! Grease the baking pan or cake pan with butter. In a pan scoop the sugar and mix it with honey. Let it melt on low heat and then cook further until the color changes to amber ;(stay with it, because the time that it's amber is very short and if you're not careful you will burn it (experience :-(). Turn off the heat and mix the baking soda quickly through the caramel with a spoon. The mass will foam and bubble. Immediately pour the caramel into the baking pan or cake pan and set aside. Leave it for a few hours until it has hardened. Then remove from the pan and break into pieces. Did a werewolf come along, who wanted to take a bite of this delicious cupcake. You tell me! This delicious cupcake is a real Halloween topper. Just because it looks like a werewolf is stand by to eat them when he’s got a chance. My children really had to think twice before they took the first bite. These cupcakes are, of course, very nice to make for a Halloween children’s party. 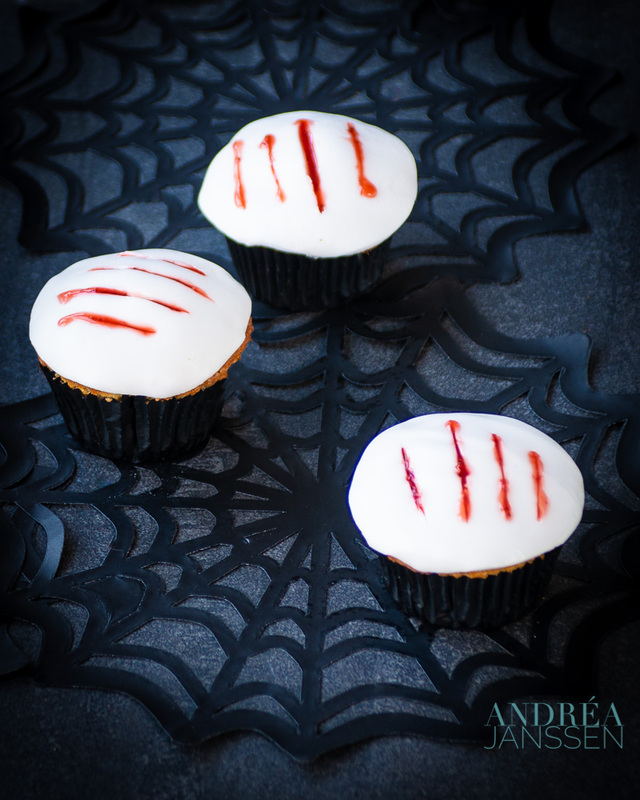 They are just simple cupcakes (the ones who never fail), with frosting and 4 claws made from strawberry sauce. Although you may think that this costs a lot of work, that is not true. You make the cupcakes in about 20 minutes, I finished the decoration within fifteen minutes. Actually, cooling down might have taken the longest time. To place the cupcake even more in the theme, you can, when you have put the batter into the molds, add a teaspoon of strawberry jam in the middle of the batter. Let the cupcake cool down to room temperature before topping it, otherwise your icing will melt. Icing can be bought and rolled out, but did you know that you can also buy sheets, where you only have to stick out the shape with a round cutter. Put the cupcake molds in the baking tray. Beat the butter creamy at high speed with a mixer. Then add the sugar and mix for another 2 minutes. Reduce the speed of the mixer to medium and add the eggs 1 by 1. Add the next one when the first one is fully incorporated in the batter. Then add the vanilla extract and continue mixing. Spoon the flour into the bowl and mix the flour through the batter with a spatula. Spread the batter into the molds and put in the oven for 20 minutes, or until the moment when the cakes are golden brown and done. Spread 1 teaspoon frosting on each cupcake. Roll out the icing until it is about 3 mm thick. If you have a sheet of icing, all you have to do is remove it from the packaging. Use a 7 cm cutter and cut 12 rounds out of the fondant. Stick it on the cupcake (the frosting will cause the icing to stick). With a sharp knife make four notches in the icing of each cupcake. With a toothpick make sure that the edges look a little frayed and that the claw marks are open. With a spoon or a pipette, fill the claws with the strawberry sauce. It’s almost 5 december and on that date we celebrate in the Netherlands Sinterklaas and I think you can compare it with Santa Claus, just a little bit earlier in December. We celebrate it 5 December. One of the traditions is that we ate lots of pepernoten. So today I share a recipe with pepernoten, called pepernoten muffins. If you like it, but you can’t buy them, this is the link to the recipe of the pepernoten. How did some one think of the name pepernoten (in English: pepper nuts). In the earliest recipes one of the main ingredients was… pepper. During time the recipe is adapted and a mix of spices is created. But pepper is stil an ingredient. The spice mix for pepernoten smells delicious and everybody gots it’s own recipe. When I make my own, I usually mix the following spices (all grounded) as mentioned in the recipe below. If you don’t got paper cupcake forms or won’t use them, butter the baking form to easily release the muffins. Don’t use butter that’s easy to smear on room temperature. It can happen that the piping won’t last. Better choose a firm butter. Mix the spices very well and store in an airtight jar so you can use them all winter. Put the butter in a bowl. Mix the butter with a mixer on high speed for 3 minutes. Add the sugar and whisk another 2 minutes. Break the eggs, one by one and add to the batter. Add the second egg when the first one is completely combined with the batter. Pour the vanilla-extract in the bowl and whisk another minute. Add the self-raising flour and mix the flour in the batter with a spatula. Crunch the pepernoten and add to the batter. Whisk very gently with a spatula until everything is mixed. Put the cupcake forms into the baking form and pour in the batter until the forms are 2/3 filled. Fill all the forms and put the baking form in the oven. Let the cupcakes cool down for 5 minutes and release them from the baking form. Let them cool down on a rack to room temperature. To make the butter cream add the butter and icing sugar in a bowl. When they are combined add 2 tablespoons milk. Change the mixer to high speed and mix for another 3 minutes. Spoon the cream into a piping bag. When the cupcakes are cooled down to room temperature, pipe the butter cream on the cupcakes. Sprinkle mashed pepernoten as garnish on top. This recipe for mini cheesecakes with forest fruit jelly has a crispy bottom, a creamy cheesecake with a sweet forest fruit jam in it. And because they are single servings, it’s easy as a party treat! Try yourself. Cheesecakes are always a delicious cake to serve on a birthday party. And even if you think, cheese in a sweet cake, you’ll see after preparing it it won’t taste as usual cheese. The cheese in cheesecake recipes refers to cream cheese and tastes more like a thick cream than cheese. That’s because cream cheese is made from milk and cream. And it doesn’t get ripened you eat it fresh, so it does not take time to develop a taste. That makes it very useful to use in sweet recipes such as cheesecakes. Cheesecake recipes are very old. They are found back to the ancient Greeks and every country has its own varieties. 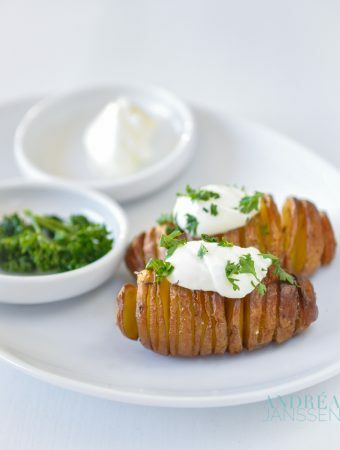 In the Netherlands this is often the unbaked, whisked version with cottage cheese. In other countries it’s usually baked in the oven. What most cheesecake recipes have in common is that they are baked on a crumb of biscuits, on which the topping is applied. Cheesecakes are often flavored. Chocolate and fruit are often the first choices, but you can find caramel, vanilla and even tea varieties. Like the varieties I have on this website you will find some delicious other cheesecake recipes: pumpkin cheesecake, a cheesecake with white chocolate and passion fruit and Dutch syrup waffle (stroopwafel) cheesecake. All off these delicious cheesecake recipes are baked. And so I found out that I haven’t got a Dutch cheesecake version on my blog. Of course I’m going to change that very soon. The cheesecakes in this recipe I baked on a bottom of coffee cookies. I find that the most delicious cookies to match a cheesecake recipe. Then the filling is poured over and a teaspoon of jelly is add. By baking them in the muffin pan you will get individual pastries. And that’s very nice. Just try it yourself! This recipe for mini cheesecakes with forest fruit jelly has a crispy bottom, a creamy cheesecake with a sweet forest fruit jam in it. And because they are single servings, it's easy as a party treat! Try yourself. Grease a muffin mold with oil. Put the cookies in a food processor and grind them well. Melt the butter in a pan and pour the melted butter with the biscuits. Divide the biscuits mixture at the bottom of the 12 muffin molds. In a second bowl, mix the cream cheese with the sugar, about 3 minutes at high speed. Add the egg, the sour cream, the vanilla extract and the lemon and mix another 3 minutes. Divide the cream cheese mixture over the 12 molds. Heat the jam until it becomes liquid. Spoon a teaspoon of jam on top of each cheesecake. With the back of a spoon swirl the jam gently through the batter. Put the cheesecakes in the oven and bake for 10 minutes. Turn the oven off and leave them in the oven, with the door closed, for 30 minutes. Put the cheesecakes in the refrigerator and cool for at least 3 hours. Loosen the muffins with a spatula and remove them from the mold. Cherry cake with pudding, through the cake batter you swirl pudding and cherries. A full taste, nice as a pastry, but also as a dessert. 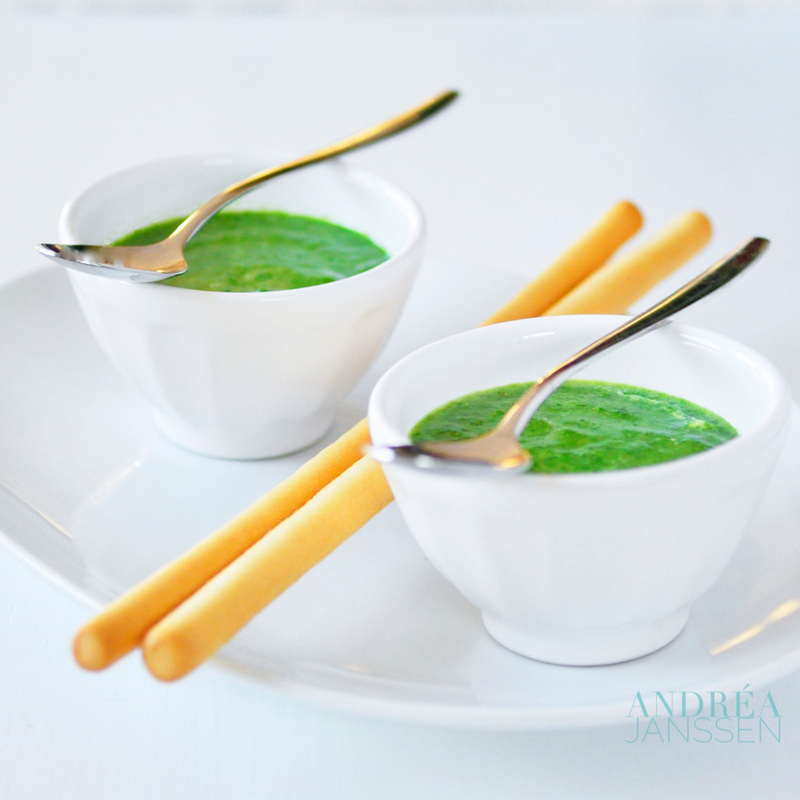 This month, I also participated in the food blogswap and I was assigned to the blog of Ellouisa’s cooking (Dutch blog). After I found out I decided to surf straight to her blog to see what recipe I would choose. She’s written a lot of recipes so that was even difficult. Finally, I had two recipes that made my tastebuds go crazy: the blissful sinful chocolate caramel cake or the cherry cake with pudding. But for the blissful chocolate caramel cake you really have to have something to celebrate like a birthday party. And our middle child indeed had his birthday, but by then I would be to late to post. But I put it on my bucket list to try sometimes. So I decided to bake the delicious cherry cake with pudding. And I made it as a dessert for Easter. Because a cake can be delicious as dessert. And certainly with all the allergies and intolerances that are in my family (and not only with me), the cherry cake would be just great for everybody. What I liked in this recipe is that even the pudding was made from scratch. The cake is thus completely homemade. And honestly, therefor it just got it’s delicious flavor. And although it seems all very workable, believe me that isn’t the case. The cake was ready to bake in the oven within half an hour. By adding the maizena to the cherries the cherries drop less quickly into the pastry. The cake contains less butter and oil is used instead. This makes the cake moist and flavorful. Grease the spring form (diameter 26 cm) with butter and sprinkle with flour. Take the acces flour out. Put baking paper on the bottom of the tin. Put the milk with the vanilla extract in a pan and boil on low heat. Meanwhile, beat the egg yolks in a bowl until they are light yellow and frothy. Mix the maizena through the egg yolks with sugar. Sprinkle the hot milk into a thin dribble into the bowl with egg yolks (do not pour the milk too fast or you'll get lumps) while stirring with a whisk. Then pour everything back into the pan and cook again on low heat. Keep stirring with a whisk. Let it simmer on low heat as you keep stirring, until you can dip a wooden spoon into the cream and draw a line with your finger in the pudding layer and the line won't immediately flush. That will take about 2-3 minutes. Pour the cream into a bowl, press a plastic foil on top (so you do not get a sheet) and put in a bowl of cold water so that it cools down quickly. Let the cherries leak out, but catch the juice. Put the cherries in a pan and measure 50 ml of cherry juice. Mix the cold cherry juice with the maizena and pour it with the cherries. Put on low heat and bring to the boil while stirring gently (otherwise the cherries will break). Cook for 1 minute on low heat. Put the pan with cherries in a cold bowl of water. ix in a bowl the flour with the baking powder. Mix in another bowl the butter, oil and sugar for about 3 minutes until it is airy. Add the vanilla extract and the eggs while mixing. Do not add the next egg until the first one is incorporated. Put the mixer on low speed and add 1/3 of the flour mixture, then half the milk, 1/3 flour mixture, remaining milk and the rest of the flour. Turn off the mixer when the flour is mixed. Spoon the cake batter into the spring form. Put the pudding in a piping bag and spread bubbles of cream in the batter (in different places). Spoon the cherries across the batter. Try to divide as much as possible. Put in the oven and bake for 40 minutes. Remove from the oven and leave for 5 minutes. Take the cake out of the spring form and let it cool on a wire rack. Store the cake until use in the refrigerator. Lay two sheets of puff pastry in front of you, just overlapping. Place the steak in the middle and roll the pastry loosen around it. Press firmly add the seam. Brush with beaten egg and place on a baking plate covered with baking paper paper. Make sure the seam is faced to the bottom. Place the Beef Wellington at least 15 minutes in the refrigerator to let the meat rest. Preheat the oven to 240 degrees Celsius. Cut with a knife sharp notches in the top of the puff pastry. 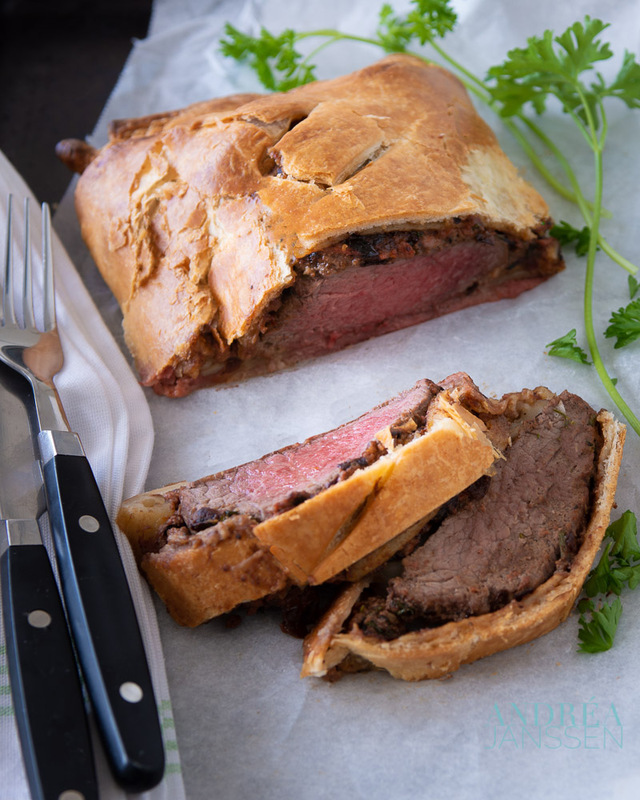 Put the beef Wellington in the oven and reduce the oven temperature immediately to 220 degrees Celsius. Bake for 10 minutes, and then lower the temperature to 200 degrees Celsius. 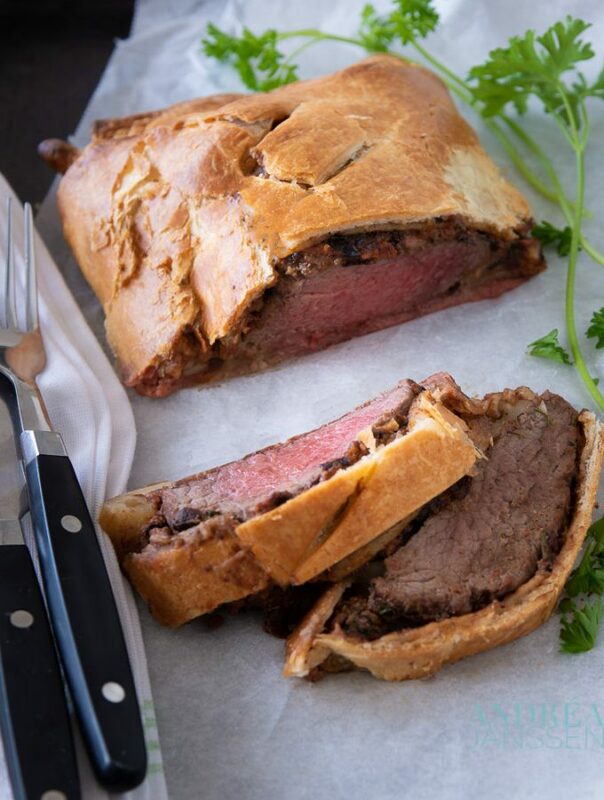 Bake the Beef Wellington until the meat thermometer inserted in the thickest part of the meat indicates a core temperature of 57 degrees Celsius, after about 20 to 25 minutes. Take the Beef Wellington from oven and let the meat rest for 10 minutes before serving. Enjoy! In America you hear sometimes the term macaroni with cheese (mac and cheese) in tv series and movies. A dish that they eat there often it seems. A traditional recipe. And although we here often eat pasta and macaroni thereby is used regularly I have never made a pasta recipe (other than lasagna) from the oven. And I really wanted to know whether I was missing something. I mean, as a part of the population is so fond of it, am I missing something? So I took the plunge and went searching in my cookbooks. And in a Christmas Cookbook by Nigella Lawson (who always cooks so delicious), I came across a macaroni and cheese recipe. However, there was one but, the recipe was to feed a complete orphanage so much pasta (which perhaps was not surprising, since it was written in the chapter come along and I think many people want to eat at Miss Lawson, I at least would if I were invited). So I had to rewrite it. And when I was doing that I saw that I needed condensed milk. In a macaroni recipe which was something I’d never come up with. I often use it in cakes or sweet desserts, but a hearty pasta dish … But if Nigella says you have to use it you of course add it and won’t change it for something else. And I must say, after I made it I thought it was actually a very successful addition. Unexpectedly, certainly, but very successful. My compliments to Nigella, definitely not longer question her recipes. And now you want to know what it tastes like? I’d say try it out. We were certainly surprised by the wonderful flavor combination. Grease a baking dish with a little butter. Put a pan with plenty of water on the stove and bring to a boil. Cook the pasta al dente and drain it. Add all the flour at once, while you stir and let it bake (the raw taste of the flour goes off), do not change color, about 2 minutes. Carefully pour the milk to the butter mixture, stirring with a whisk to avoid lumps. Then add the condensed milk, and heat well, but just not boil. Mix the three cheeses together in a bowl. Get a hand out and mix the rest of the cheese with the milk sauce (stirring with a whisk). 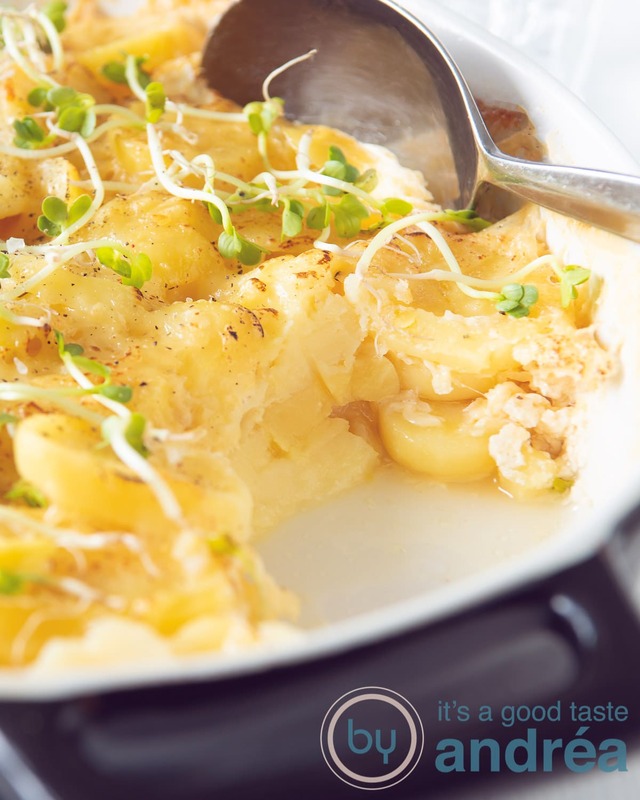 Put the macaroni into the baking dish and pour the cheese sauce on top. Sprinkle the leftover cheese on top and put the dish it in the oven. Crunchy chocolate biscuits on a chocolate cupcake with cream cheese topping. Baking Oreo cupcakes is not difficult with this recipe. Oreos have special status, it’s trendy to eat them. How they ever succeeded to that cult status, no idea, but perhaps it is because of the delicious taste. The two chocolate cookies with a delicious cream almost irresistibly tasty. Nowadays they appear in many new variations, but for me the original version is still the very best. Now Coen, our youngest, loves to bake and he asks every weekend, what shall we try this time. Not good for the figure, but great to bake together. And he wanted something with Oreo. Oreo cupcakes seemed very tasty to him. So we first baked chocolate cupcakes and then we made a topping with Oreo crumbs. Coen found that there actually should have been a topping of a whole Oreo, but I myself felt that probably was just to much, so the compromise was to take half a cookie. It therefore looks more festive. And off course we made a photo to show the end result. Let the cupcakes cool down to room temperature after baking and before piping the topping. Otherwise the topping will melt and drips off the cupcake. Make sure the cream cheese and butter are at room temperature, otherwise you get lumps in the topping. Use powdered sugar instead of regular sugar in the topping. Regular sugar does not dissolve well and then you get a crunch topping. Because you use crushed Oreo take a nozzle with a large opening, preferably no cartel, which clogg very quickly. After making the cupcakes save them in the fridge, and they will certainly stay good for two days. 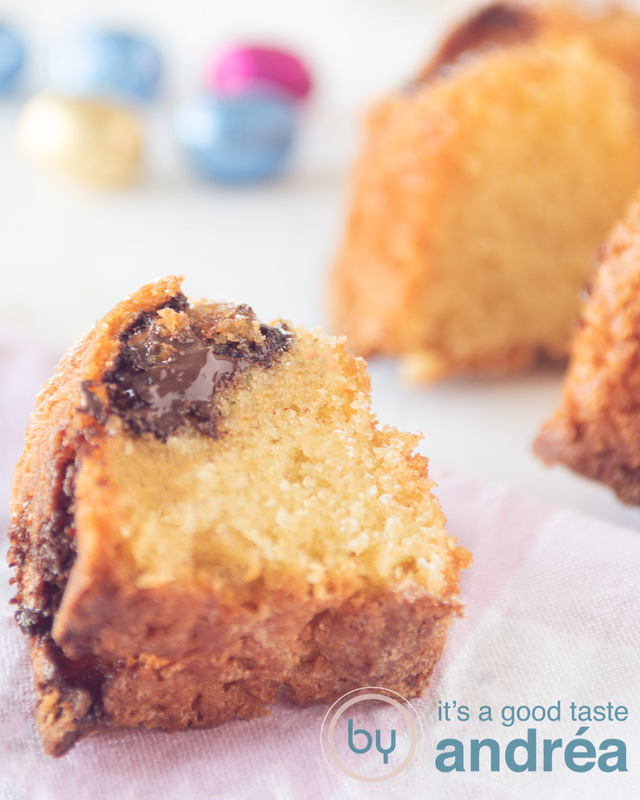 Cake filled with chocolate easter eggs, a recipe with that wonderful Easter feeling. Very easy to make and fun to serve at Easter at tea. Easter egg hunt, my children are busy with the search all morning. Not that I make it so hard for them to hide, no that something I wouldn’t do. But they always hide them again and again. First the oldest hides them away and the other two search. And then the next one will hide and the others will search. A great fun game hide and seek with Easter eggs. In the mean time I like to bake something sweet for Easter at tea time. For the kids they don’t really need something sweet because they will totally fill themselves with chocolate Easter eggs, but as adults we don’t overeat ourselves with chocolate eggs. And so I make a pound cake for us like, for example, this cake filled with chocolate easter eggs. Delicious festive Easter feeling. You can do this of course with only white chocolate eggs or even milk or dark variant. But it looks much nicer if you have all those flavors mixed in your slice of cake. And that’s my tip: for the best cake mix them up. Make sure all ingredients are at room temperature. Therefor your cake will become airy. If your oven got two heating options (convection and top and bottom heat) you will get the best result by top and bottom heat at 190 degrees Celsius. Make sure you mix the butter and sugar airy, certainly don’t mix too short. Once you add the flour your batter will loose air. Flour makes the batter heavier and less airy. So mix too long after adding the flour and you get a compact cake. That’s something you don’t want isn’t it? Brush your cake tin with butter and dust with flour. The excess flour have to be knocked off (otherwise you get flour spots on your cake and that is not nice and not tasty). And after baking let the cake rest for five minutes before you remove the cake tin. In this way your cake will loose easily and won’t break. Check if the cake is done by stabbing a skewer in the middle of the cake. When it comes out dry, you can remove the cake from the oven. Grease the cake tin with butter and dust with flour. Make sure you shake the excess flour from the cake tin. Put the butter and sugar in a bowl and mix on high speed for 3 minutes, so that it becomes pale and fluffy. Add the vanilla extract and eggs one by one, while continuing to mix at high speed. Turn the mixer off and sift the flour, salt and baking powder over the bowl. Mix everything on low heat until it is just combined. Then mix with a spatula the chocolate eggs through the batter. Pour everything into the cake tin and put it in the oven. Bake for 50 minutes and check if the cake is done with a skewer. Leave the cake to rest for 5 minutes and then remove the pan. Place the cake on a wire rack and allow to cool further. Creamy penne with zucchini and walnuts, a vegetarian recipe that will make your tastebuds go wild. It’s easy to prepare, on the table within 20 minutes. Yummy! During the week, a pasta meal is one of my favorites. Sports, appointments and meetings. Everyone is at home at a different time to eat. Luckily that’s not the case for most of the days, but if it happens then this recipe is one of my favorites (see for the tips why). Zucchini and walnuts may not be a combination that immediately comes to mind, but the delicious pasta recipe is just as good as it gets. Zucchini is baked with onion and thyme, making it absorbs all those wonderful flavors. And in the meantime you cook the penne. The penne is mixed with creme fraiche and parsley (for freshness) and you serve it with Parmesan cheese and chopped walnuts. Slice the zucchini into half moons. When eating you get on your fork a delicious mixture of zucchini with penne and walnuts. When you’re in need for some meat or you want a salty accent add some fried bacon. And for the vegetarian that’s in need for extra flavor add sliced ​​sundried tomatoes, they’re delicious. Tomato and zucchini is always a good combination. Cook your pasta al dente (look at the manufacturers manual how to). Then you’ve got a bite from the pasta and that’s delicious in this recipe with the soft zucchini and crunchy walnuts, a beautiful combination. 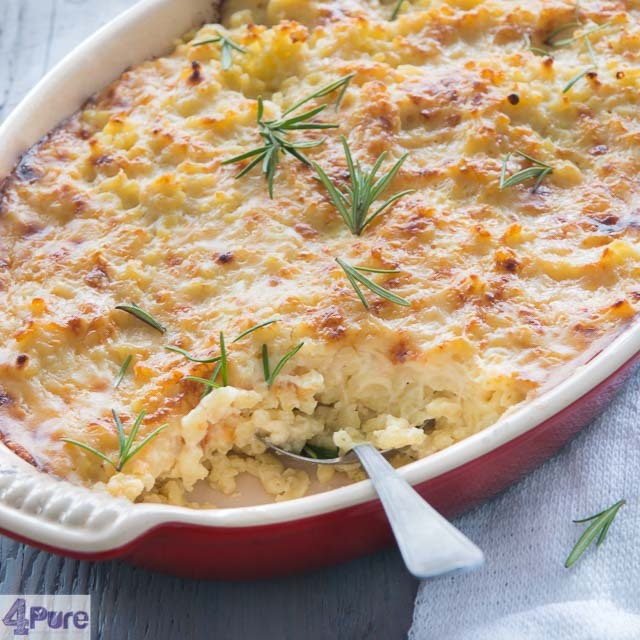 If everyone needs to eat at a different time (for sports and other activities), then divide the remaining into ramekins or oven dishes. Add some grated cheese on top and store them in the refrigerator until use. Bake for 15 minutes in a preheated oven at 220 degrees Celsius. Creamy penne with zucchini and walnuts, a vegetarian recipe that will make your tastebuds go wild. It's easy to prepare, on the table within 20 minutes. Yummy! 2 large zucchini sliced and halved. Heat a frying pan with butter and oil until hot. Mix the thyme and zucchini with the onion. Reduce heat to low put the lid on the pan, and simmer for 15 minutes. In a large pot filled with boiling water, boil the penne according to the manufacturer's instructions until al dente. 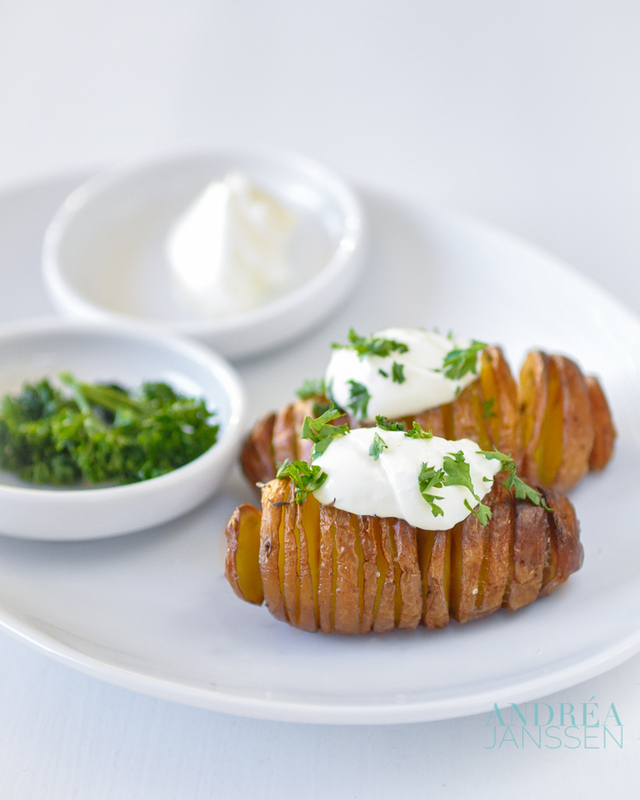 Drain and mix with sour cream and parsley. Then mix the zucchini mixture through. Serve immediately with the walnut and Parmesan cheese as a side. Creamy intense chocolate flavor, topped with heavenly white chocolate cream and crunchy pistachios. This recipe you should really try yourself. Of course, this is not one of the most low-calorie recipes. On the contrary. But it is one of the tastiest recipes. These cupcakes are a real treat for yourself (and your friends and family). The cupcake is chocolate flavored, airy and intense. Then there is a chocolate ganache made from dark chocolate. Which you sprinkle with pistachios. The lightly salted variant, because a touch of salt and chocolate go so beautifully together. Then you add a topping of delicious creamy white chocolate butter cream. A beautiful contrast with the dark chocolate. When you take a bite and taste all these flavors at once, you end up almost in chocolate heaven. What you should pay attention, especially in the winter is that you use the butter cream made from cows who are fed with grass. Butter from cows that have been fed with hay tends to stay a bit hard at room temperature, so you get lumps in your butter cream. Really a no-go, so petty of all the effort you have made. And of course I have some extra tips for you. Make sure all the ingredients for the cupcakes are at room temperature. Therefore, the cupcake become nice airy. If you have an oven with top and bottom heat then use it when baking cakes. The cake will bake pretty evenly heated and does not burst. Use good chocolate for the ganache. Otherwise you get too much oil in the topping, which is not pretty. Also make sure that the chocolate pieces where you add the cream to, are sliced small, otherwise you will not get good smooth ganache. The bowl in which you whisk the egg whites (which you hang above the water) must be free of grease. So before use clean it with hot water and detergent.